"For the F-14's ALR-67 (-B) and ALR-45 (-A), we're working on a new, in-depth simulation of RWR antennas and how they're affected by various factors. This also includes recreating the way the cockpit systems interpret and process the data received by the system. Here's a quick video from the Chromecat branch showing how the location of the RWR antennaes influences signal processing and display in the F-14! Read the detailed description of what is happening below. AN/ALR-67 is the radar warning receiver (RWR) system used in the F-14B. The eyes of the system are four spiral high-band wide-field-of-view antennas looking front right (45°), back right (135°), back left (225°), and front left (315°). The two front antennas are located on the sides of the air intakes, and the two rear antennas are attached to the horizontal stabilisers. When the aircraft is pictured by a radar beam, the RWR antennas receive the emission. The closer the beam direction is to the antenna centre of the view, the stronger the registered signal is. The AN/ALR-67 electronics compares signal amplitudes from the antennas and uses the strongest two to reconstruct the incoming signal direction. In the video, the simulated radar location is to the aircraft rear and below. When the left stabiliser rotates and moves the trailing edge up, the antenna rotates up too, and the incoming radar signal shifts away from its centre of view - thus the registered signal becomes weaker. At the same time, the signal in the front left antenna doesn't change. The electronics don't know about the horizontal stabiliser deflection and interpret the change as the emitter moving away from the rear left antenna field of view. Heatblur AN/ALR-67 will simulate: radar wave attenuation, signal reception for each antenna independently, antenna condition (damage), signal amplification and threat direction reconstruction from the received signal amplitudes. Just as a real unit does, no faking or RWR-magic." That is modelling of the antenna "beam pattern". Apart from a basic on/off pattern, this is the first time I've seen someone try to model the actual directional response. Nice. Admin (Dietrich) wrote: That is modelling of the antenna "beam pattern". Apart from a basic on/off pattern, this is the first time I've seen someone try to model the actual directional response. Nice. i've read a reddit comment that had me cracking.. Does anyone know if the Hornet’s RWR is as realistic as this? F-14 September Update - "See you on Oct 7th!" I'm not really interested in the F-14, but I must admit that those graphics are rather amazing. They do look very good .... I'm not immediately rushing to purchase this model myself but credit where it's due, it appears the bar is being raised and what awaits those getting the Tomcat will be quite something. Long answer is: the model is an EFM meaning the flight model was developed outside of ED and in fact is a program that runs outside of DCS. 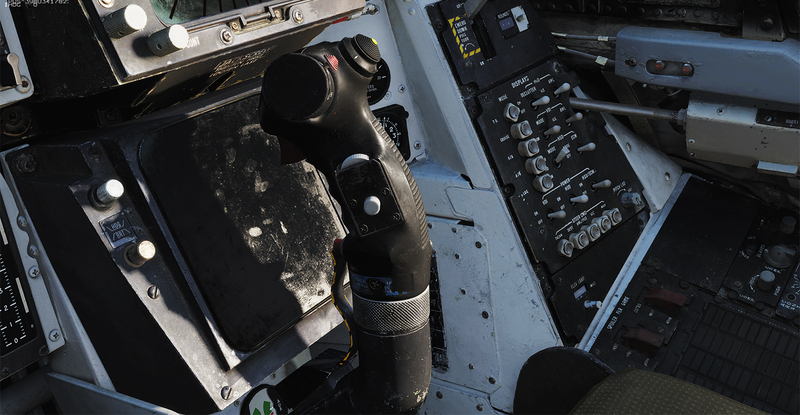 It receives atmospheric and physical parameters (speed, AOA, etc) from DCS which is then fed into the Heatblur FM program. The program then crunches all the info and feeds forces to the rigid physics model inside of DCS. The "External Flight Model" is the same idea that some of the civil aviation sims use. Export the data to the external programme, do your own modelling, and then force the aircraft position/attitude back into the sim. Very ambitious, but it does allow you to do some things that the base sim doesn't handle. What would be interesting to know is if this is an F-14-only EFM, or whether it will apply to the other modules being produced by Heatblur. This is actually the only path that third party developers have open to them other than the SFM I understand. I believe that this is a significant part of the problem the VEAO have had and Belsimtek has been the only outside agency that has had access to the PFM and might explain why they were so prolific. It is likely also the reason why they were chosen to develop the new flight models for the F-15C and Su-27 stand alone modules. Of course ED never refered to them as a Third Pary but as a Partner and now they have been effectively absorbed. I am sure that this EFM will be F-14 only, they already have one for the Viggen, however I am sure that each new EFM they develop will push the bar further built on what they did previously and may lead that technology to be implemented in the Viggen as well.